An absolutely beautiful place to visit, the ‘Garden Isle,’ as it is also known, is home to some of Hawaii’s most breathtaking sights, and visitors to Kauai are certainly in for a treat with all the beautiful scenery on show. Having featured in innumerable Hollywood films, the dramatic mountain ranges, sweeping valleys and plunging waterfalls are now often associated with movies such as Jurassic Park, which was filmed here. One of the western-most isles of Hawaii, Kauai is very impressive to visit, and many of the island’s most spectacular sights are inaccessible by car or on foot. Consequently, the best way to explore its vast array of pristine and protected natural wonders is to take to the air for a bird’s eye view of what’s on offer. 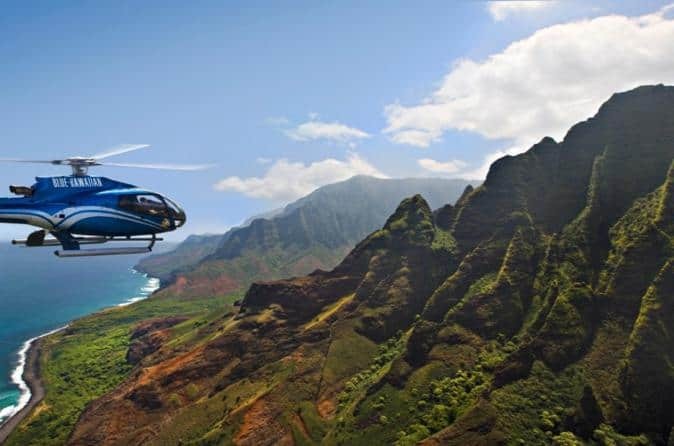 To help give you an idea of what options are out there, here are some of the best helicopter tours which will take you to all of the best locations such as Waimea Canyon and the Na Pali Coast. This exhilarating flight over Kauai will live long in the memory as you soar high above the stunning scenery below you, drinking in the sights to your heart’s content. Beautiful to behold, the Na Pali Coastline is a dramatic landscape, full of plunging valleys and cascading waterfalls. Many of the sights you see on this tour are completely inaccessible, and as such remain in pristine condition. Equally spectacular is Waimea Canyon, with its distinctive red walls which contrast beautifully against the dark blue waters below. A memorable experience, this flight is a once-in-a-lifetime opportunity to see Kauai from the air. Accompanied by an expert guide, you’ll get to see many of Kauai’s most spectacular sights on this wonderful full-day tour, and you’ll certainly come away awestruck at all that you’ve seen and done. Exploring the northern and eastern coasts of the island, this tour provides a captivating experience as you visit some beautiful beaches, mountains and waterfalls throughout the day. A number of historic sites are included in the tour. The cruise up the Wailua River is a delightful affair as you pass such incredible scenery, and many people also opt to take a helicopter ride above the island to get even better views of the ‘Garden Isle’. 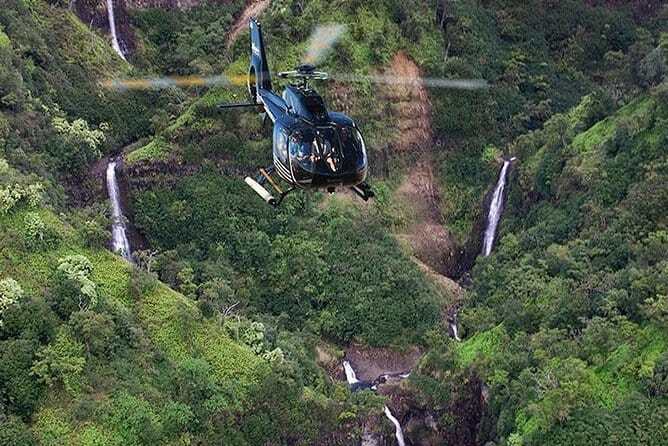 Highly recommended, the ride in the chopper is not to be missed as it offers up unparalleled views of Kauai’s hidden interior. Soaring above the island in a chopper will leave you with longlasting memories of an unforgettable day out. Guests invariably come away delighted at the whole experience, vowing to return. After embarking, it’s time to buckle up and let your professional pilot fly you around the island, while you sit back and drink in the awe-inspiring scenery. Passing above Mount Waialeale and the Waiapuna Waterfalls, you get a bird’s eye view of the spectacular terrain. You may just remember some of it from watching Jurassic Park all those years ago. After that, it is off to the red walls of the Waimea Canyon which is sometimes called the ‘Grand Canyon of the Pacific,’ before heading to the captivating ridges of the Na Pali Coast. With so much to see, it is lucky that you have your guide on hand to tell you all there is to know about these natural wonders. 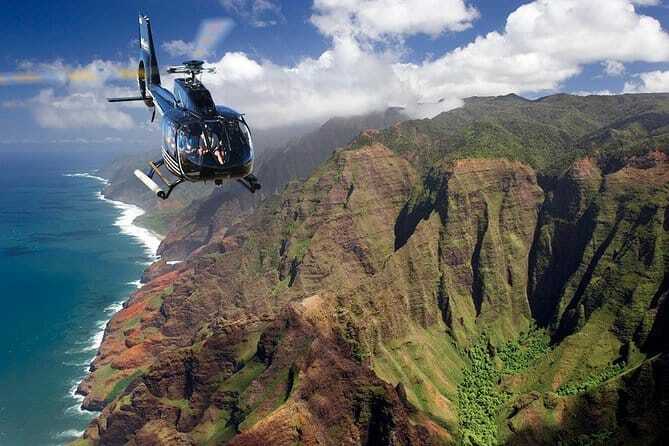 A wonderful excursion, this thrilling flight takes you above some of Kauai’s most spectacular sights. You’ll certainly come away raving at all of the incredible scenery you’ve flown over. On the fifty-five minute ride, you’ll get unparalleled views of the lush Hawaiian rainforest. The Na Pali coastline is also among the many highlights as its jagged green ridges plunge dramatically into the Pacific Ocean down below. Appearing as if out of Jurassic Park, Kauai needs to be seen to be believed, and the stunning Waimea Canyon will leave you with no doubt that you’ve experienced something extraordinary. Starting off from Oahu, this fantastic combo tour sees you explore Kauai by both land and air. On the way, you’ll get to see much of the remarkable scenery that has so memorably featured in such blockbusters as King Kong, Raiders of the Lost Ark and Lilo & Stitch. With visits to some stunning beaches included on the tour, alongside stops at plunging waterfalls and the island’s main town of Kapa’a, it is guaranteed to be a busy day of sightseeing which you won’t regret for one minute. Following the morning’s activities, it is time to take to the air and gaze upon Kauai’s majestic landscapes from the comfort of a helicopter. Passing over the amazing sights will set your heart racing, and the thrilling ride is likely to be one of the best things you’ve ever done. 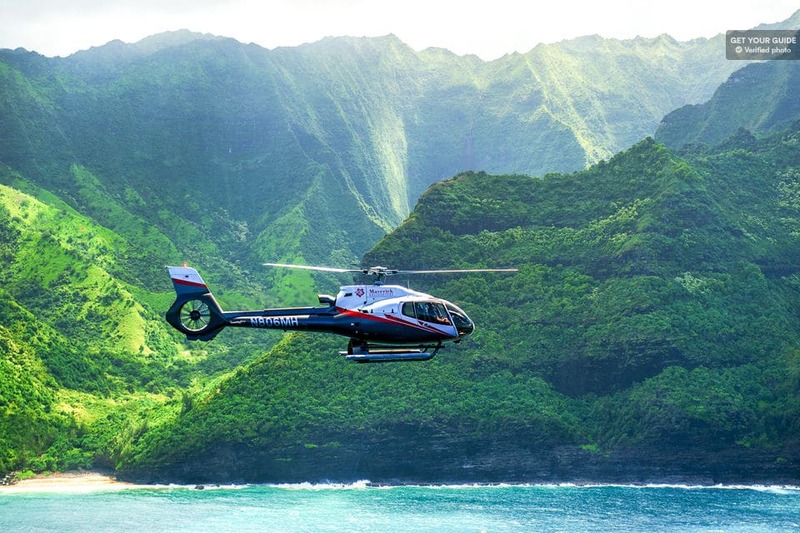 Once you’ve been strapped in and have listened to the safety protocol, it’s time to sit back and enjoy the adventure of a lifetime as you soar above the beautiful island of Kauai that is home to so many stunning mountains, gorgeous waterfalls and incredible landscapes. On your fifty-five minute flight, you’ll get to see a plethora of amazing sights, each more jaw-dropping than the last. Manawaiopuna Falls (which you may remember from Jurassic Park) is just one of the many attractions on show, and is located in the sweeping Hanapepe Valley. No flight over the island could be complete without stopping by Waimea Canyon and the Na Pali Coastline, as their distinctive and unique characteristics make them truly special to behold. The tour culminates with a pass over the huge Mount Waialale, home to the stunning Waipo’a Falls which drop a staggering 245 metres to the ground below. Soaring above the famed ‘Garden Isle’ is a delightful affair, as the lush vegetation below you contrasts stunningly with the dark blue waters that surround the island. The heart soars to behold such beauty. Flying above Waimea Canyon is a captivating experience as the ground plunges away below you. You’ll also get great views of Awini and Waialae Falls which glitter and sparkle amidst the foliage. With grand mountains and sweeping valleys everywhere you look, the scenery beggars belief and perfectly conveys the majesty of the nature on Kauai. 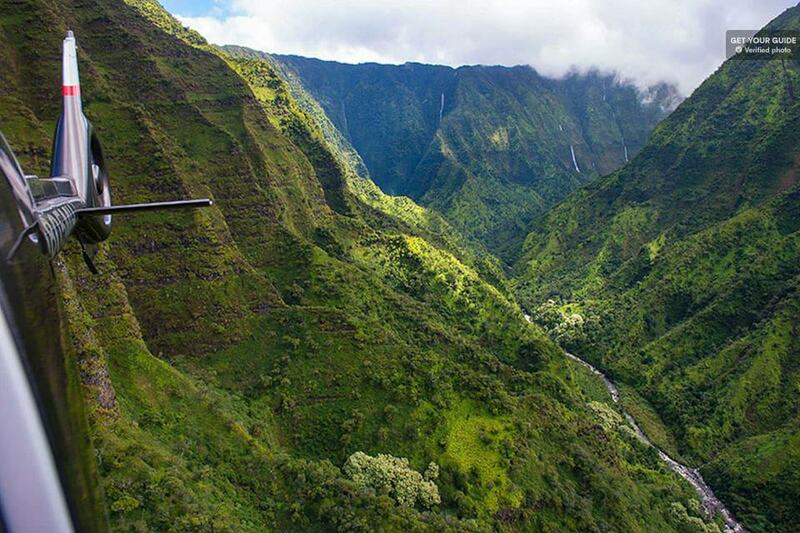 A magical experience, you can’t go wrong with this scenic flight over the best of what Hawaii has to offer. 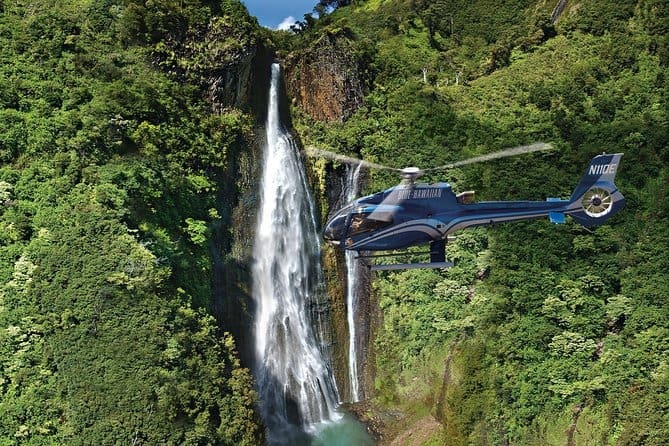 Shooting through the air above Hawaii’s most beautiful island is an absolute dream, and it is no wonder that helicopter tours above Kauai have become increasingly popular in recent years. With many of the sights inaccessible by land; they are a fantastic way to see as much as possible. Seen from above, you really get a feeling for the sheer size and scale of the spectacular Waimea Canyon and the jagged Na Pali Coast and the photos that you’ll take away from your trip will astound all of your friends and family. 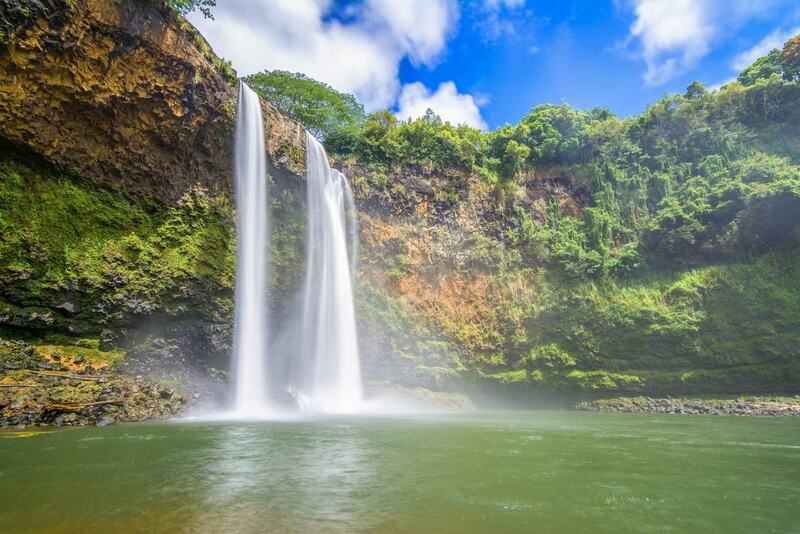 This Ultimate Kauai Adventure tour also takes you to the sparkling Wailua Falls as well as the Alakai Swamp, which is home to a rich array of fauna and flora. Among the many highlights is the towering Mount Waialeale, which is famous for being the wettest place on Earth due to the huge amount of rainfall that it receives. One of the most visibly stunning places that you’ll ever see, Kauai is remarkable for its wealth of incredible natural sights, and it is one of the most beautiful islands in the whole of the Pacific. 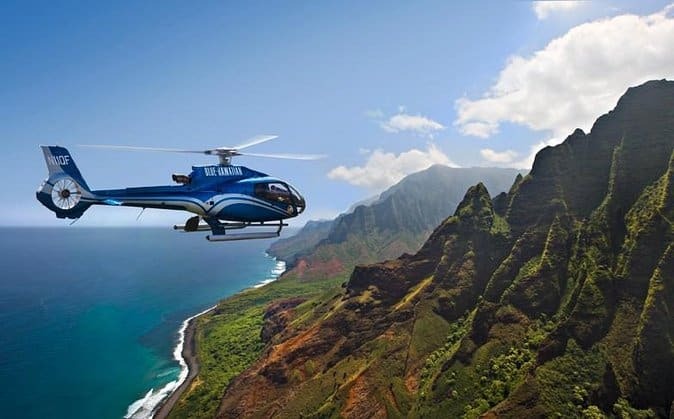 Departing from Princeville, this tour takes you on an unforgettable helicopter ride above many of the island’s main attractions such as Waimea Canyon, the Na Pali Coast and Manawaiopuna Falls, which was used as a filming location in Jurassic Park. Accompanied by a professional pilot who also acts as your expert guide, you’ll learn all that there is to know about Kauai and come away with a greater appreciation for the majestic geological formations, the lush fauna and flora and the diverse landscapes that you pass over. A simply fantastic trip, the waterfalls, bays, mountains and more will be etched in your mind for years to come.